There was a lot of excitement from H when we heard there was going to be a LEGOLAND® Discovery Centre in Birmingham. We’d made the journey up to Manchester a couple of times and had a lot of fun there. 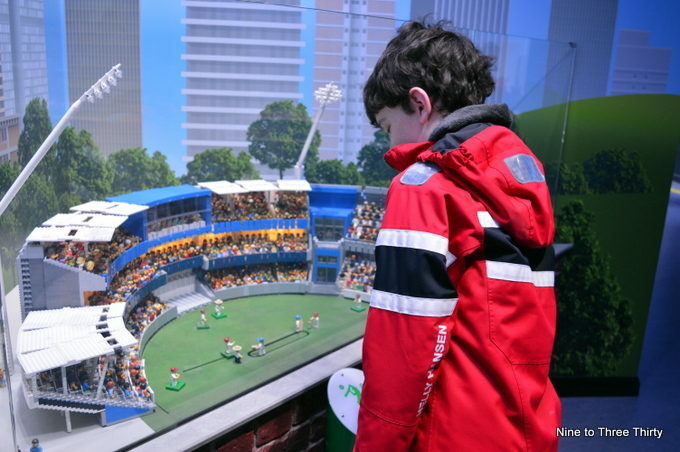 H was keen to see how the LEGOLAND® Discovery Centre Birmingham compared to the Manchester one. Would it be the same or would there be different things? Find out how we got on and read our full review below. Our party included 2 adults, 2 11-year-olds (nearly 12) and a 9-year-old. I did wonder if at nearly 12 the boys would be too old for it, but I could not have been more wrong. As you enter the centre you get the opportunity to go on the Kingdom Quest laser ride, which is a favourite for us. You can fit 5 into a car (3 in front and 2 behind), which was perfect for our party. A captured Princess needs your help so you need to zap all the beastly trolls and sneaky skeletons with your special laser gun to rescue her. We loved this ride because you can all take part and each individual’s score is logged on their own screen. There’s a bit of friendly rivalry that goes on and you can easily go back on again later for a rematch. This ride is a lot of fun and it’s certainly one of the highlights for us. We spent quite a lot of time in MINILAND as there was so much to do and look at. I felt quite proud of how many lovely buildings Birmingham actually had to copy, some of them old and some of them new. There were a few sporting venues from outside the city centre including the Edgbaston cricket ground that H has been to for Twenty20 matches, plus Villa Park that he’s been to for a football match too. Both the cricket ground and the football ground are quite interactive too, in fact Villa Park works a bit like a game of table football and you can try to score a goal. Once we made it through to the main open space for the LEGOLAND® Discovery Centre Birmingham we found ourselves in a bright and colourful space with the cafe area at the heart of things and various areas around it. The adults made a beeline for the cafe to sit down and rest, but the boys were immediately off to build cars and race them. I am not joking when I say that they spent about 2 hours doing this. They were trying to build the car that went fastest and were keen to race their cars against those of other children and the timer clock. So much fun! There are plenty more things to do though. There’s the 4D cinema which is well worth a visit. The movies are shown in rotation and they last about 20-30 minutes each. There are various areas to build things including a Duplo area and a Lego Friends one. There’s soft play and the Merlin’s Apprentice Ride. In fact, we didn’t get around to trying out everything, so we will certainly be back to take in some more Lego fun. After we came out we had to spend a lot of time in the shop as there was so much to see in there too. Depending on your child’s interest in Lego, you could easily spend a whole day in LEGOLAND® Discovery Centre Birmingham, but half a day would be a lot of fun too. 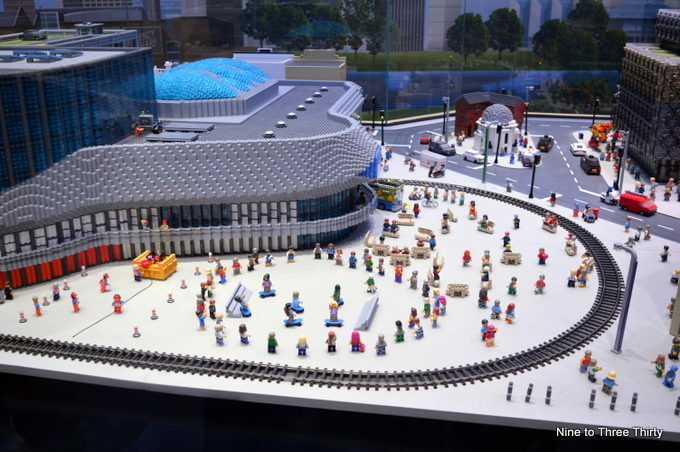 So what about the questions we had at the start about the LEGOLAND® Discovery Centre Birmingham? Would it be the same or would there be different things? The answer in fact is that it’s very similar, but also different too. It’s a bit smaller it’s true, but I felt they’d made better use of the space available and it did seem to flow better. 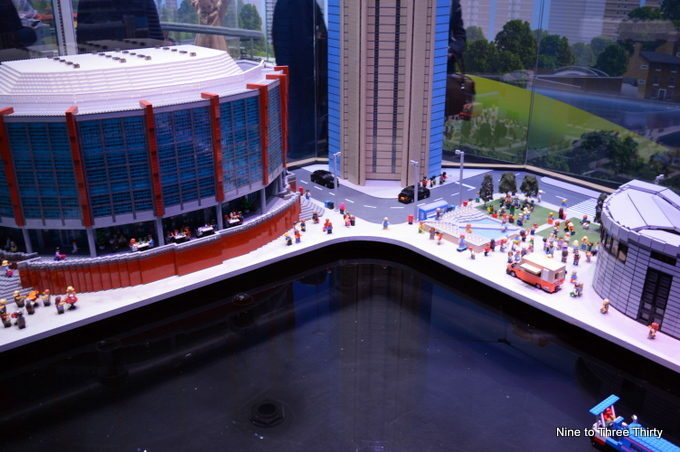 We felt MINILAND was better in Birmingham, even discounting that it was more fun because we knew the buildings as it seemed more interactive. The cafe feels more central in Birmingham and it was very easy to sit at a table and keep an eye out for the boys whereas that wasn’t so easy in Manchester. But, best of all for us it’s in our home city which makes it an easy journey. It’s easier to get to for anyone visiting by train too as it’s very walkable from the train station. 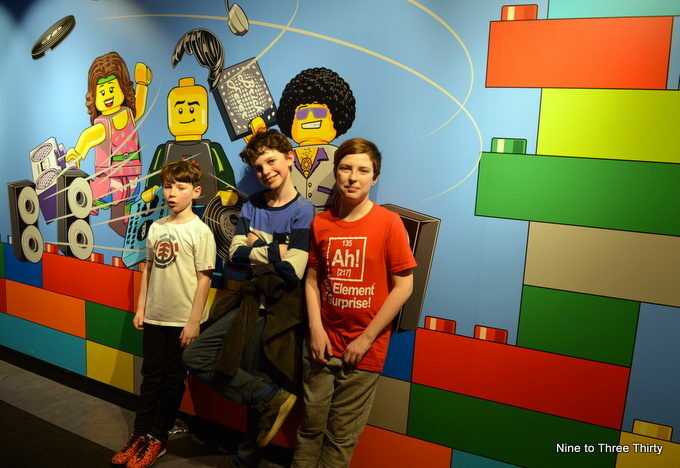 In addition to the main attraction activities and rides, from Saturday 9th February, LEGOLAND® Discovery Centre Birmingham will be opening the doors to a new installation and series of themed activities – which will run for a limited time to celebrate the launch of Lego Movie 2. With out-of-this-world experiences, you’ll be able to say hello to movie characters Emmet and Wyldstyle, make your own escape vehicles and race them against others down a zip line in one of the new creative build challenges PLUS recreate your favourite film scenes against a green screen with your very own minifigure creations! Disclosure: We were given free entry to enable us to check out LEGOLAND® Discovery Centre Birmingham. I really need to go when they have an evening opening for grown ups as I’m a huge lego fan. Not having kids means I can’t go normally. michelle twin mum recently posted..When you have Nine Stone to Lose…. Some great photos there, sounds like it was well worth a visit. My kids love Lego, this sounds like a fun day out for them! We visited for the first time at Halloween and loved it. It was great to see that they’d added pumpkins etc to the displays. My grandson loves Lego so this would be a great day out for him. I’m just waiting for the toddlers to be old enough to enjoy it but it looks amazing still!